This article is about mammalian anatomy. It is not to be confused with pinnae of leaves. 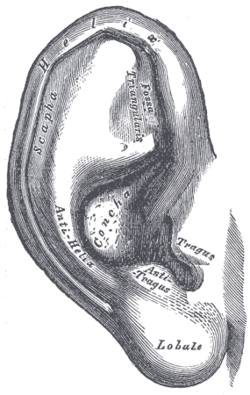 The auricle's functions are to collect sound and transform it into directional and other information. The auricle collects sound and, like a funnel, amplifies the sound and directs it to the auditory canal. The filtering effect of the human pinnae preferentially selects sounds in the frequency range of human speech. Amplification of sound by the pinna, tympanic membrane and middle ear causes an increase in level of about 10 to 15 dB in a frequency range of 1.5 kHz to 7 kHz. This amplification is an important factor in inner ear trauma resulting from elevated sound levels. Due to its anatomy, the pinna largely eliminates a small segment of the frequency spectrum; this band is called the pinna notch. The pinna works differently for low and high frequency sounds. For low frequencies, it behaves similarly to a reflector dish, directing sounds toward the ear canal. For high frequencies, however, its value is thought to be more sophisticated. While some of the sounds that enter the ear travel directly to the canal, others reflect off the contours of the pinna first: these enter the ear canal after a very slight delay. This delay causes phase cancellation, virtually eliminating the frequency component whose wave period is twice the delay period. Neighboring frequencies also drop significantly. In the affected frequency band – the pinna notch – the pinna creates a band-stop or notch filtering effect. This filter typically affects sounds around 10 kHz, though it can affect any frequencies from 6 – 16 kHz. It also is directionally dependent, affecting sounds coming from above more than those coming from straight ahead. This aids in vertical sound localization. In animals the function of the pinna is to collect sound, and perform spectral transformations to incoming sounds which enable the process of vertical localization to take place. It collects sound by acting as a funnel, amplifying the sound and directing it to the auditory canal. While reflecting from the pinna, sound also goes through a filtering process, as well as frequency dependent amplitude modulation which adds directional information to the sound (see sound localization, vertical sound localization, head-related transfer function, pinna notch). In various species, the pinna can also signal mood and radiate heat. External ear. Right auricle. Lateral view. ^ Moore, K. L. The Developing Human: Clinically Oriental Embryology, ninth edition. Saunders. p. 445. ISBN 1437720021. ^ a b Middlebrooks, John C.; Green, David M. (1991). "Sound Localization by Human Listeners". Annual Review of Psychology. 42: 135–59. doi:10.1146/annurev.ps.42.020191.001031. PMID 2018391. ^ "CIPIC International Laboratory". interface.cipic.ucdavis.edu. Retrieved 2016-12-09. ^ a b c d Ear Deformities. Division of Plastic and Reconstructive Surgery. University of North Carolina at Chapel Hill School of Medicine. ^ a b c d e f g h i j k l Hawke, M. (2003) Chapter 1: Diseases of the Pinna. Ear Disease: A Clinical Guide. Hamilton, Ontario. Decker DTC. ^ a b c d Pinna abnormalities and low-set ears. MedlinePlus. ^ a b Neonatal Dermatology: Ear Anomalies. Archived November 9, 2013, at the Wayback Machine Auckland District Health Board.